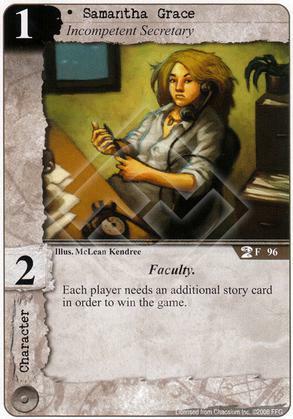 Each player needs an additional story card in order to win the game. controlling player from winning the game? Has anyone built a deck with her? She seems like a solid character. My question is though if both players have three stories and she is removed what happens? I believe the active player gets to decide who wins. EDIT: According to the FAQ entry on Conspiracy Theorist (which applies here), the active player is considered the winner if Conspiracy Theorist is blanked/removed from play when both players have 3 stories in their won pile (I would argue this also applies even if the non-active player has more than 3 stories in their won pile). Therefore, the active player doesn't decide who wins - they win automatically. hmm interesting. I mean she isn't save a lot of ways to remove her but does seem like a solid cheap character for slower decks.